Winter isn’t quite ready to leave yet. That means a lot of time stuck indoors with the kids and we need to find fun ways to occupy their time. The good news is that practicing speech can be done just about anywhere with minimal prep time and clean up required. Here are some fun ways to practice speech while the weather keeps you indoors. 1. Speech Sound Scavenger Hunt: Go through the house and find as many items as you can with your child’s target speech sound. Have your child practice saying each item they find in a short phrase (ie: I found a ____). You can even take pictures on your phone of these items and print them out to make a short book to practice. 2. Speech Sounds with Playdough: Have a list of words containing your child’s target speech sound. Have your child create one of the items from the list out of playdough. You then have to guess what your child has created. 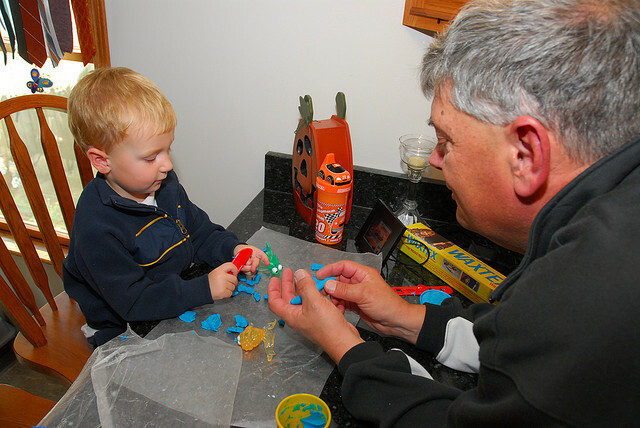 You can then switch roles with mom or dad creating words out of playdough and your child guessing the target word. Only accept an answer as correct if your child uses their “good” speech sounds. 3. Speech Sound Story time: Go through picture books and have your child point out words and pictures containing their speech sound. Have your child practice these words in short phrases (ie: I see a ____ or Look there is a _____). 4. Speech Sound Flashlight Hide and Seek: Place words or pictures with your child’s target sound on the walls throughout the house. Turn off the lights and have your child “seek” the pictures hung up throughout the house by using their flashlight. Have your child say each target word when they find it. 5. Speech Sound Pictionary: Have your child draw a picture of a word containing their target speech sound. Guess what your child drew, make sure you enunciate your child’s target speech sound. Then switch roles and draw a picture with your child’s target speech sound. Have your child guess what you have drawn. Only accept an answer as correct if your child uses their “good” speech sounds. Sensitive Sam is the story of Sam, a young boy with sensory over-responsivity. He is more sensitive to the way things smell, sound and feel and has difficulty with daily life activities such as getting ready in the morning and playing at school. The book describes many of the sensations that Sam experiences as overwhelming. At times, the language can sound a little negative, but by the end of the book Sam works with an occupational therapist and discovers sensory diet techniques that help him tolerate the sensations inherent in his day. In the end, Sam concludes: Take it from me, Sensitive Sam, That things will be okay. By doing things a little differently, I can have fun EVERY day! Sensitive Sam would be an appropriate book for children who have sensory over-responsivity. They may feel alone in their experiences, and the book offers comfort that they are not the only ones who hate the feel of clay or the sound of a toilet flushing. We appreciate the author writing this story about a boy with sensitivities, as young boys may face more social stigma than girls with sensitivities. The book does not go into detail about the sensory diet activities Sam uses to help with regulation, but the book would be a great jumping off point for a family to discuss the sensory strategies that work for their child.